The Old Man in Motion is a fanatic for “smaller and lighter” and I went from feeling like a longshoreman to a ballet dancer when I switched from my 13 inch MacBook Pro to my 11 inch MacBook Air. For most of the tasks on the road—email, social media, web-browsing—the smaller screen real estate is fine, and there is a palpable difference in bulk and weight with the smaller air (oh, and you can still juuuust barely use it in coach if the seat in front of you reclines….try that with any other laptop:-). But on my around the world jet trips for National Geographic Expeditions, and certain other assignments, I have to produce a rough cut video while I’m on the road, and on those Nat Geo trips particularly, they make all of us speakers present from an iPad on the jet’s AV system, not our laptops (don’t ask me why, but I think it’s because of the ubiquity of the iPads among speakers). So, I have to carry an iPad whether I like it or not I’ve gotten used to it and when I travel with Peggy, she likes it to read the NY Times and such). But it always felt like a superfluous, weight-adding luxury… until, that is, the Duet Display app was invented. True, there have been wireless apps that let you use an iPad as a second display for a while, but I tried two and they were laggy and buggy. 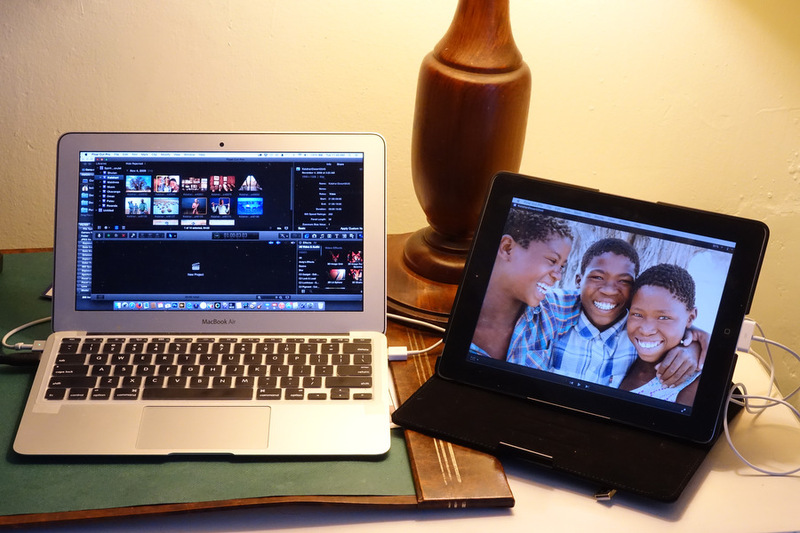 However, Duet Display uses the USB cord, which gives it a hard wire connection from your computer to the iPad, using the iPad’s charging cord. I got the app at the introductory price of $9.99, but I think the regular price is $14.99…either way, it’s worth it. Thus far, Duet Display behaves like a champ, for me at least. You may want to do a little research, because I’ve read that it actually works a little better with older, non-Retina iPads, but since that’s all I have, that’s all I know. I also know that in this upcoming year, which is featuring an ungodly amount of travel for the Old Man in Motion, this little app is going to save me not only from eyestrain, but also from the dreaded EAS (Editing Avoidance Syndrome). That’s really cool. I’ve used a wireless app and it was fine, but the lag was killer. Greetings from the UK. I shoot architecture and interiors on location and this app is a real step forward in my workflow when on the move.